Planting has finally come to a slow down with most guys either done, or wrapping up with a few acres of beans this week. After a light frost last weekend, corn looked pretty rough this past week. We have since gotten a bit of a warm up that has seemed to green up the corn and bring it back to life. First crop alfalfa and rye are in full swing. We have gotten the chance to take our demo W260 self propelled wind rower to a few customers to showcase the machine along with the 500R rotary cutter. The 500R cutter features constant header speed. This keeps the head at a constant speed no matter the engine RPM’s, keeping the same windrow formation across the field. On this particular cutter we have the V-10 rolls. The V-10 steel rolls feature 10 angled flutes arranged in a chevron, or V-pattern along the length of the steel core. This style roll offers an adverse crop cutting option. With the 10 flutes, this allows for a more aggressive crimping for a more uniform conditioning. This also provides a quicker dry down time. 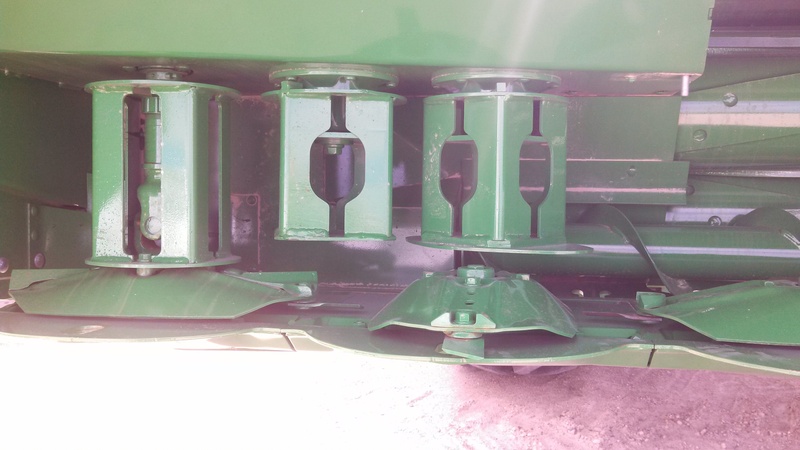 John Deere also offers 2 other styles of conditioning rolls including, urethane and tri-lobe steel rolls. Tri-Lobe steel conditioning rolls have three intermeshing chevron lobes to crush the length of the stem for improved conditioning and faster dry down. This style of roll perform best in alfalfa and other thick stemmed crops, where the roll breaks down the stems to provide excellent dry down time. As far as the machine, the large drive tires and IntelliAxle rear suspension system provide the superior ride quality and controllability. I had the chance to ride in a customer’s older 4995 while demoing this machine, it is a night and day difference in ride quality, even over rougher terrain. Integrated AutoTrac delivers extreme accuracy at high cutting speeds. Integrated AutoTrac is an industry exclusive, without needing universal add-ons or hydraulic pumps. Using AutoTrac allows to keep the head fully engaged with crop at all times, making for a more consistent windrow even at speeds above 12 MPH. Going higher speeds while taking full head cuts and using AutoTrac, yields more productivity per hour, but also allows the operator to run longer hours due to less fatigue of operating the machine. There is not another windrower on the market that will AutoTrac and steer as well as this machine does on contour strips and straight tracks. Perfectly straight windrows also makes the chopper operator extremely happy, which makes their job a lot easier. If you are interested in demo-ing this W260 or any other piece of equipment, get with your local AMS personnel and they will explain to you what we have to offer. It’s still pretty busy in Southern Wisconsin. With all of the cool and wet weather over the last few weeks, some guys are just now finishing up corn and beans. Others are busy spraying, cutting down rye. or making hay. Some sidedressing has started as well. Most of the corn in the area is getting a little yellow from the dampness and nights still in the 30’s. Today’s sun and heat is just what it needs. The ExactEmerge stands look very good. We walked some fields and talked to customers today. Overall they are very happy. The singulation and spacing is very good. 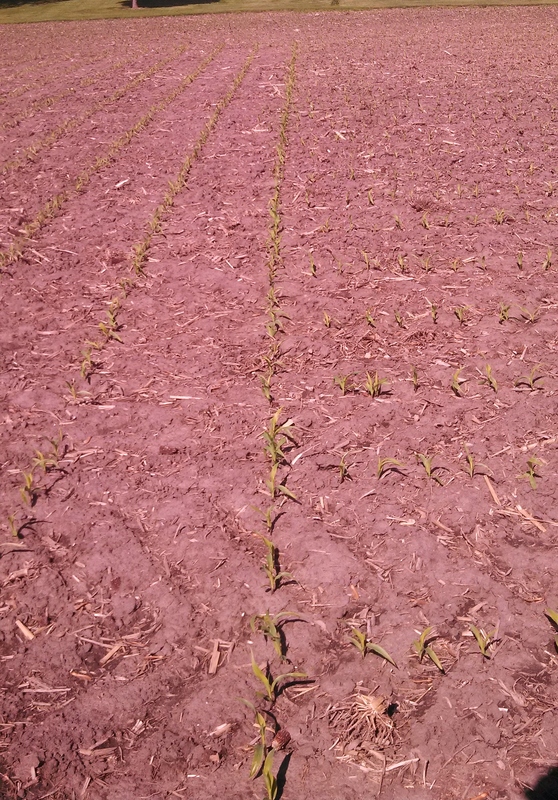 The planters that we checked also had sectional control dialed in nearly perfect. 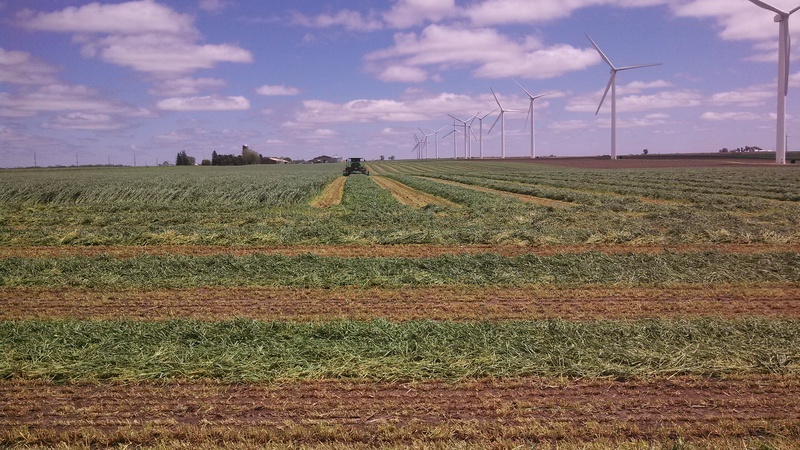 We have cut some rye and alfalfa with the new W260 windrower and new 500R platform with Tri-Lobe conditioning rolls. The W260 has a 6.8L engine that with 260 engine horsepower at 2400 rpm and up to 285 horsepower at the power bulge. The windrower didn’t bog down at all in tall, wet, and sometimes lodged rye, all while going a constant 12 mph across the field. Meanwhile, a competitor’s windrower couldn’t get over 6.5 mph in the same field. The W260 seems to be a great fit for heavy crops and/or hills. The new 500R platform was making a very nice and even windrow in both rye and alfalfa. The 500R includes a new overshot cross auger that delivers increased performance in windrow formation and cut quality. Crop flow is also improved because of the auger and additional converging drums that are taller and closer together on each end of the platform to provide an even flow into the conditioner while reducing bunching, recutting and wrapping on the ends.